Decorate your ride with a personalized car magnet for your car door. 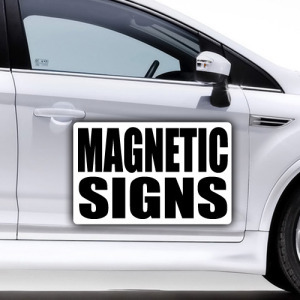 Whether you’re advertising a business, supporting a cause, or celebrating a passion, these cool car magnets get noticed and turn your auto or truck into a true vehicle of communication. Find different sizes – from magnetic bumper sticker sizes to bigger and bolder large decal style car magnets. Choose from thousands of designs. This is a high quality, strong blank magnet material sized to be the backing for a bumper sticker decal that you already have. 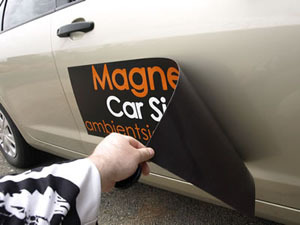 Place your sticker on this magnet, then place the magnet on your car. Bumper Sticker Magnet is great for honor student stickers, campaign political stickers and team stickers. Simply apply your bumper sticker to the magnet, trim to size with scissors and attach the magnet to your car or whiteboard at work. We can make custom sizes and custom designs as per your requirements. The best personalized magnets for the fridge, we can print in any color, at a very low price, with fast production times. Use our customized flexible magnets for your refrigerator. 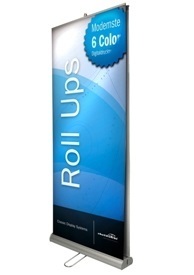 Magnets are the perfect promotional product for your customers; they will see them every time they will open the fridge. We have a wide range of personalized magnets in different shapes and sizes, they are made from high quality materials and manufactured with precision. We can print in any color at no extra cost and always quick production time. Flexible custom magnets are great for creativity, can be combined to make the shapes you want, a castle, a flower, an animal, geometric shapes, chess pieces... there are no limits to your imagination!